NCHMCT JEE 2019 Application Form: The National Testing Agency (NTA) is closing the NCHMCT JEE 2019 Registration on 25 March. Candidates can upload documents and pay the application fee until 26 April. Candidates who are interested in the hotel management from Institutes of Hotel Management (IHM) must fill the NCHMCT JEE 2019 Application Form. The aspirants needs to apply for NCHM JEE 2019 online at nta.ac.in. The computer-based test for NCHMCT JEE 2019 is scheduled on April 27, 2019. 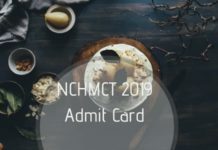 All the information regarding NCHMCT 2019 Application Form, exam date and process to apply online is further explained in the article for candidates to understand better. 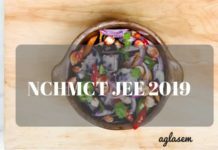 Latest: The last date to register for NCHMCT JEE 2019 is 25 March. Scroll down to register using the link provided below. 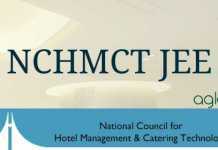 NCHMCT is one of the major examinations that is conducted for candidates applying for hotel management. 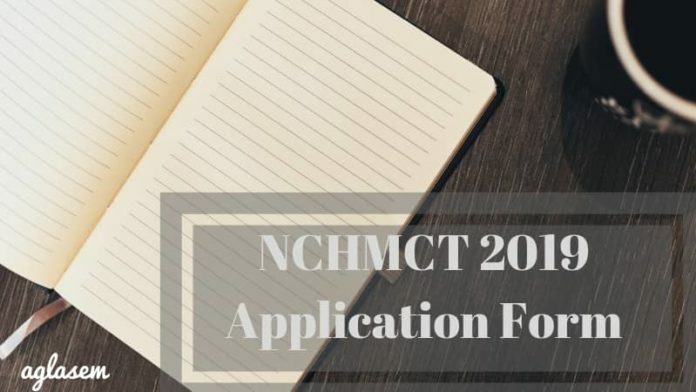 NCHMCT JEE 2019 Application Form Dates regarding admission and application process has been released by the organization. Check the schedule for NCHMCT JEE 2019 Online Application from the table below. 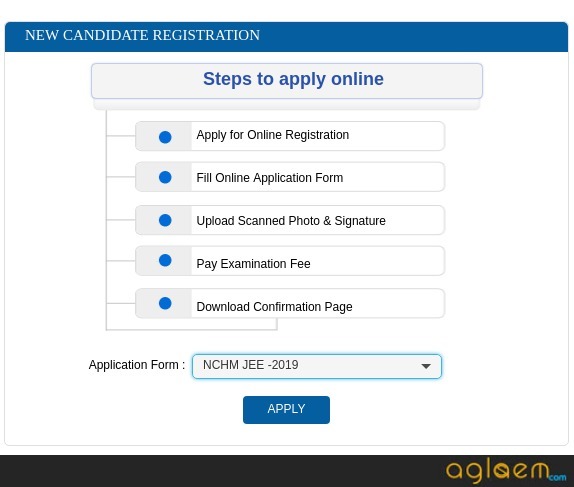 Click here to apply online for NCHMCT JEE 2019. Click here to login for already registered candidates. In order to apply for the test candidates need the list of documents that are provided below. It is therefore advised that the candidates must keep these details handy before applying for the test. Scanned images of your photograph and signature in jpg/jpeg format and size have been given below. Mode of Payment: The fee amount to be paid by candidates as per their category can be paid through the below-listed modes of payments only. Appearing for NCHMCT? Click Here to check the Sample Question. 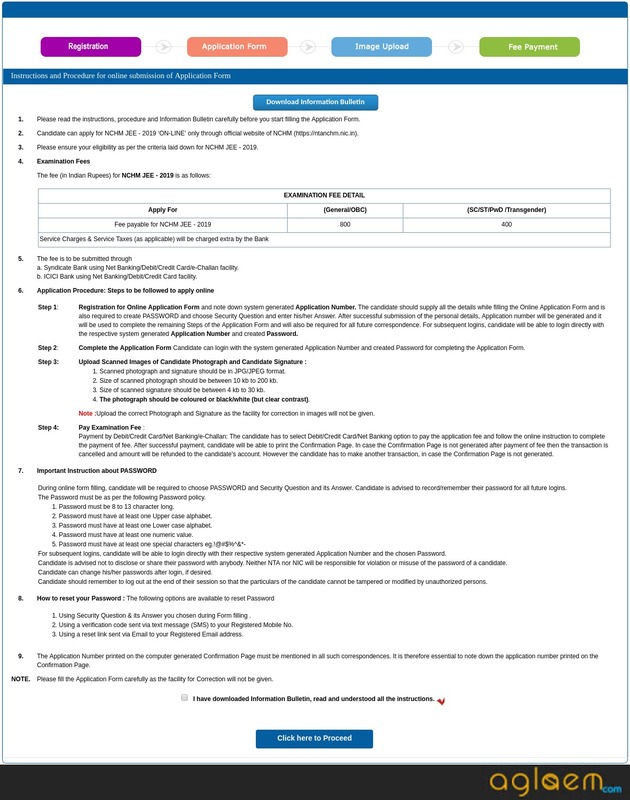 How to fill NCHMCT JEE 2019 Application Form? Firstly, click on the direct link which is provided on this page as the registration for NCHMCT JEE 2019 is started. The candidate would need to choose NCHM JEE 2019 and click on “Apply”. On the next page instruction to fill the application form will be provided. Tick on the declaration stating ” I have downloaded Information Bulletin, read and understood all the instructions” and proceed. In the NCHMCT JEE 2019 Form, you need to enter some details to initiate the registration form, details to be filled in the application form is as follows. 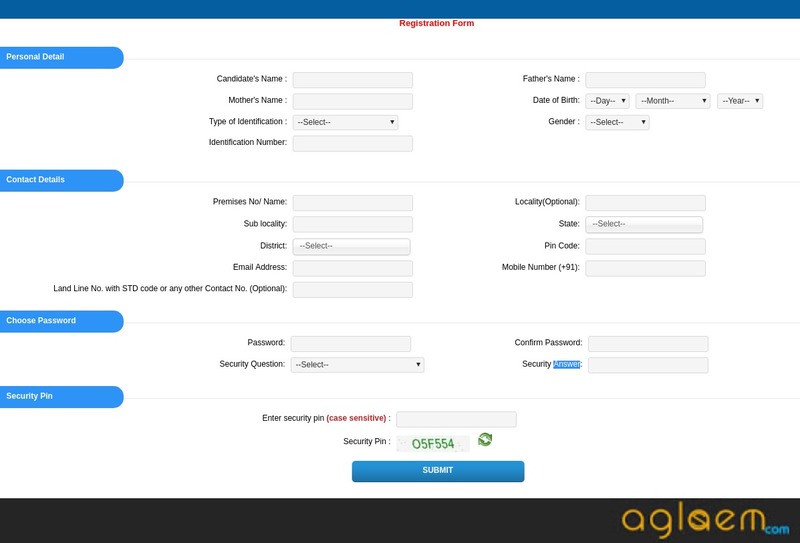 choose a password, security question and enter the security pin as shown in the image below. The final registration page will appear on the screen. Candidates will have to tick on all the details after cross-checking them. Click on to “Final Submit” and proceed. After the submission of resgistration form, candiadtes will have to click on “Complete Application Form”, to start filling the application. place of class 12th schooling? In the next section, candidates will have to select the choices of examination center. The last is to enter the security pin and click on the submit button to submit the application form. The next step in the application process for NCHM JEE 2019 is to pay the requisite amount of the application fee. The candidates shall be able to pay the fee by online mode only that is from Credit/Debit Card/Net Banking. 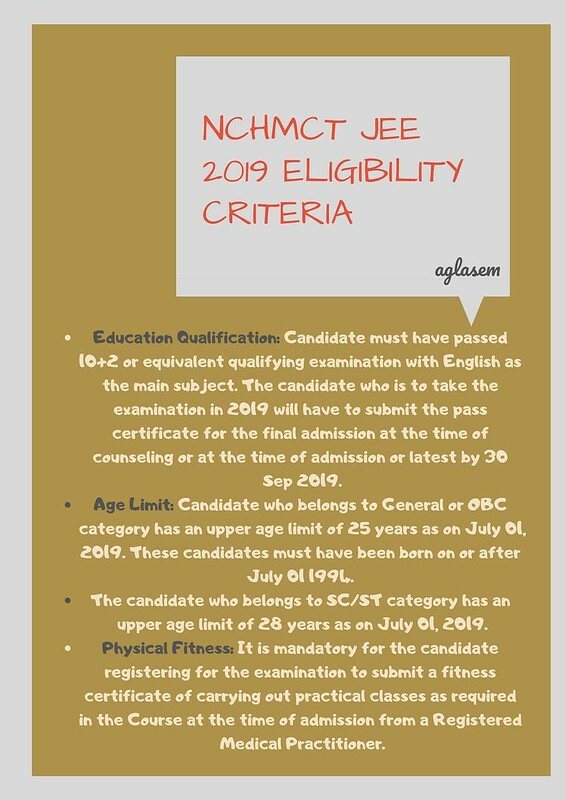 The last and final step is to submit the NCHMCT JEE 2019 Application Form and take its printout for future reference. After submitting the necessary information in the NCHMCT JEE 2019 Application Form. the next step is to upload scanned images of your passport size photograph and signature. The images must be uploaded as per the specifications are given below. The passport size photograph to be uploaded in the NCHMCT JEE 2019 Application Form must be a recent passport size photo. You should upload a color or Black/White photograph in the application form. Ensure that the picture clear Contrast, taken against a light-coloured, preferably white background. You must sign on white paper with a Black ink pen and scan it. Scan the signature area only and not the entire page and ensure that the size of the scanned image is between 4kb to 30kb. One important point to note is that this signature would appear on the Admit Card, and if it does not match the signature on the answer sheet at the time of the written test and at the time of Interview, the candidature will be canceled. As per the information, NTA will not be responsible for any incorrect information in the application form of NCHMCT JEE 2019. The candidates are therefore advised to provide proper and authentic information in the application form. Any ineligibility in the form will be rejected by NTA. 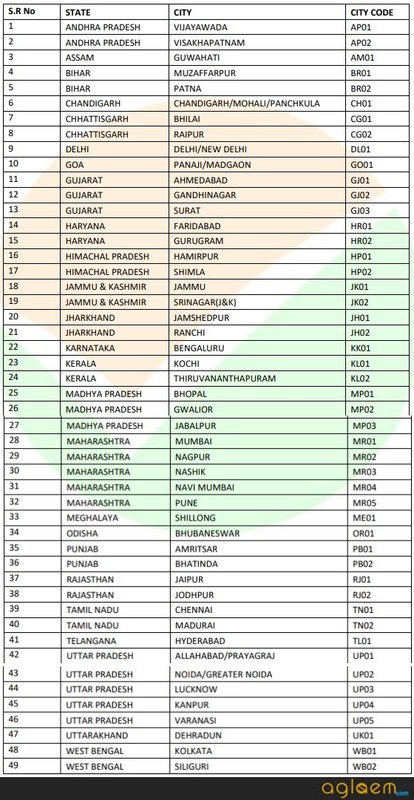 This year there is a total of 49 test centers. Candidates are to choose from these centers at the time of filling the application form. The examination centers with code are given below for candidates to take reference from. If you have any question about the NCHMCT JEE 2019 Application Form, then let us know in the comment section below.